The football fiesta will be fueled by an all-you-can-eat-and-drink buffet, priced at $200 per person. Buffett offerings will feature tailgate favorites like hot dogs, sliders and a build-your-own tacos and nachos station. All-you-can-drink options include Cabo Wabo’s signature margaritas, handcrafted cocktails and draft and bottled beers. The highly anticipated football game will be displayed on flat-panel, big-screen TVs, visible throughout in the cantina. TV screens include: a 200-inch video grid; 200-inch projection screen; a 110-inch high-definition TV; two 80-inch high-definition TVs; and 25 75-inch high-definition TVs. 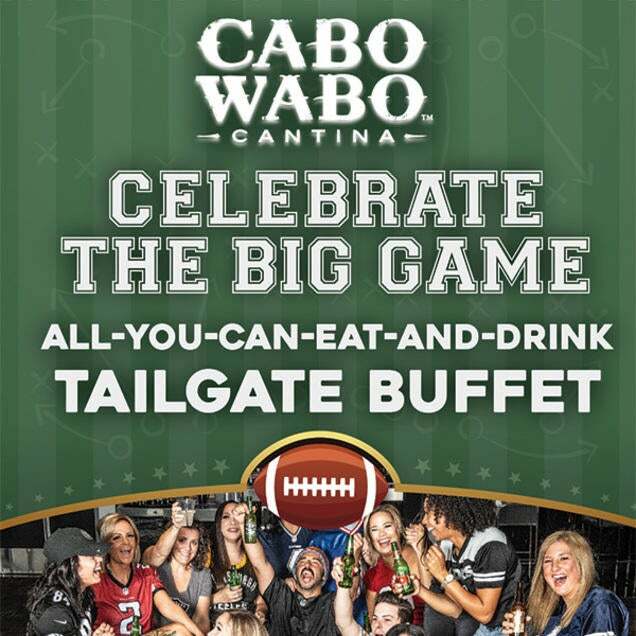 Reservations to watch the Big Game in Cabo Wabo’s private upstairs lounge, The LOFT, are also available. To inquire more information about pricing or reservations, please contact Kristen Maurer at kristen.maurer@cabowabovegas.com.